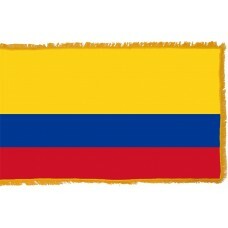 The Colombian Flag consists of 3 horizontal bands of yellow, blue, and red. 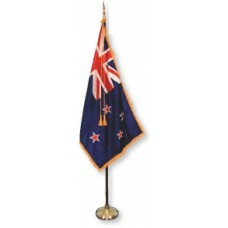 The yellow band covers half of the flag and the blue and red band cover a quarter of the flag each. The Colombian flag and the colors on it are seen as having two different meanings. The first interpretation is that the yellow color symbolizes gold, the wealth of the country's soil, and agriculture, whilst other sources consider the yellow to represent the harmony and justice of the country, as well as the sun. The blue color, according to some sources, represents the oceans and the sky, whereas others claim that it represents loyalty and attention paid to the country from the people of Colombia. The red color signifies the blood that was shed and the fight for the country's independence and in other cases is said to signify the determination and dedication of the people. 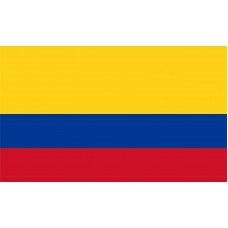 The Colombian flag, which was created by Francisco de Mirandoshares and adopted on November 26th, 1861 shares the same colors with the flags of Venezuela and Ecuador. 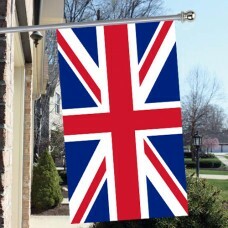 Today, it is known to be one of the world's oldest flags. Colombia is located in South America and is the 4th largest South American country. Its name was derived from the explorer, Christopher Columbus. It shares borders with Venezuela, Brazil, Peru, Ecuador, and Panama. The capital city of Colombia is called Bogota. Bogota is the second largest capital city in South America. Colombia is also referred to as the "getaway to South America," because of its location which connects South America to Central and North America. In 1499, the Spanish arrived in the country and it eventually became a Spanish colony, known as "New Granada." Colombia was under Spanish rule for 250 years. In 1808, when the French invaded Spain, it was an opportunity to try and seek independence. During the first attempts for independence, they were defeated and in 1819, following the collapse of the Spanish Empire, the Colombian forces (led by Venezuelan general Simon Bolivar) claimed victory against the Spanish and Colombia. Venezuela, Ecuador, and Panama declared independence and the country "Gran Colombia" was formed. In 1830, Venezuela and Ecuador separated, leaving Colombia and Panama together until 1835, when Colombia became a separate nation. Colombia is thought to be the 2nd most "biodiverse country in the world" and is home to the largest amount of species in the world. There are many beautiful sights to visit and the main tourist attraction in Colombia is the "Salt Cathedral of Zipaquira," which is located in Bogoto. Bogoto is a city that is full of street artists. The city is unique in that street art and graffiti are permitted and encouraged by the government. Another popular sight to visit is the "Cano Cristales," which is known as the "River of Five Colors," or the "Liquid Rainbow," as the river and beds change color between yellow, red, green, blue, and black. Visitors to Colombia also have the opportunity to see the tallest palm trees in the world, with some measuring at 60m high.